You probably know by now that I adore the patterns by Bit Of Whimsy. They are darling and so easy to put together! This one is a bunny that I did a while ago. I love the bright fabric I used and his cute face! That tooth kills me! We’ve begun a major home re-organization which currently has my sewing moved into our bedroom. I’m excited about this because it’s out of the front room and next to my computer. So I can pop a movie in, or just go to hulu.com, and watch a show while I sew! 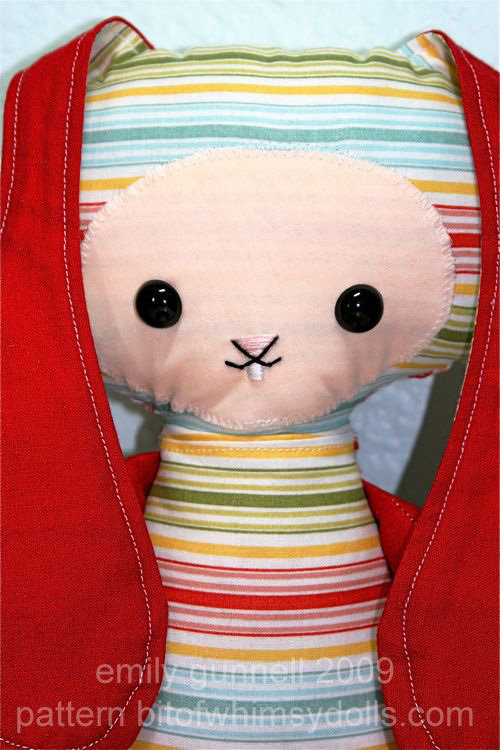 Good excuse to buy the latest kitty pattern and sew up some more cute dolls! You can find her patterns on Etsy or at her website. OMG!!! So adorable Emily. I love, love all the bright colours you used for the bunny. Thanks for the link also – I think I will have to look into this and see if I would be able to do these projects. Are they fairly easy? Very cute. Love the rainbow. It’d sell for a lot of money down in Laguna Beach area. Ha Jenna, I was just thinking the same thing! Those are adorable!